30 Park Place, 77A from Toni Haber on Vimeo.Take your rightful place among the New York City skyline in this stunning penthouse high on the 77th floor at prestigious Thirty Park PlaceDowntown Manhattan's tallest residential tower. Combining unprecedented luxury with world-famous Four Seasons amenities, this four-bedroom, four-and-a-half-bathroom showplace spans nearly 4,000 square feet with exquisite interiors, two gracious terraces, and incomparable views throughout.Literally, no detail has been overlooked in curating the Robert A.M. Stern-inspired decor, from its sophisticated modern aesthetic to its bespoke finishes. Exemplifying a truly elevated living experience, the half-floor residence with ceiling heights soaring 12' and above offers breathtaking views throughout and features the finest materials, conveniences, and craftsmanship in every room. 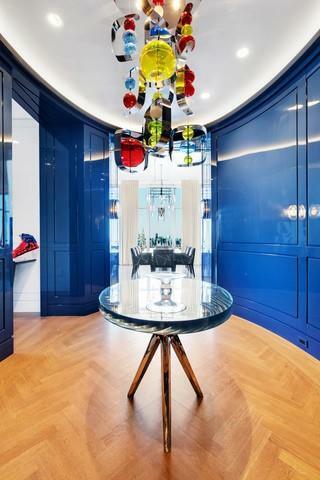 The glamorous oval reception foyer makes a dramatic first impression with its white oak herringbone floors, designer lighting, and gleaming blue lacquered walls. Ahead, the grand scale of the great roomlined in white lacquer and floor-to-ceiling windows facing north, west and eastinvites you to behold unmatched outlooks over the city's iconic architecture. The expansive corner living/dining room is warmed by a custom gas fireplace, while double doors reveal a den that can easily function as a formal dining room where the city itself becomes an invited guest. A well-placed butler's pantry with a wet bar and dishwasher leads to the eat-in kitchen beautifully equipped with custom Bilotta cabinetry, polished marble counters and a full complement of Gaggenau stainless steel appliances. 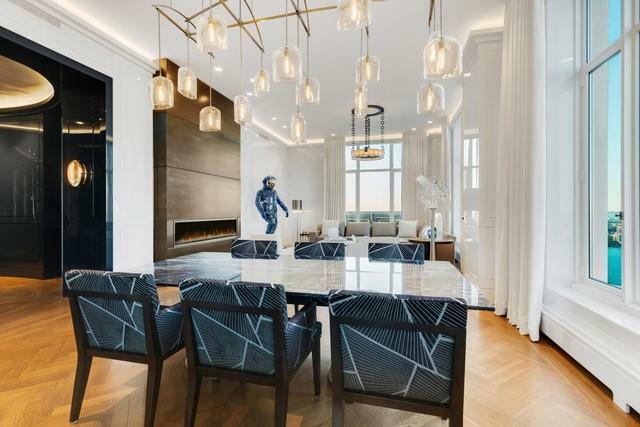 This custom corner kitchenframed by floor-to-ceiling windows and 13' ceiling heightsoffers generous space for casual dining, or dine on the private east-facing terrace, where views of the historic Woolworth Building and the East River are front and center. Two full-height Gaggenau wine refrigerators provide temperature-controlled storage, completing the home's position as an entertainer's haven. 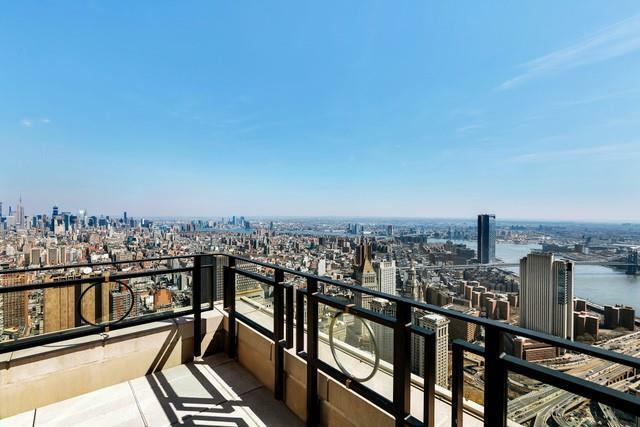 To the west of the entry foyer, a wide gallery, featuring a convenient powder room and coat closet, leads to a private, corner library and a west-facing terrace that offers one-of-a-kind views of One World Trade Center. Enjoy brilliant sunsets over the Hudson from this unparalleled perch before retiring to the master suite. Here, the magnificent custom closets and dressing area attend to wardrobe, while the en suite five-fixture marble bathroom is an oasis, filled with a freestanding soaking tub, walk-in rain shower, double vanity, and separate water closet. Set along the eastern wing, the home's remaining three bedroom suites are equally well-appointed with private baths and roomy custom closets. Additional closet space and a full-size laundry room with service entrance add total ease and convenience, while multi-zoned heating and air conditioning ensure year-round comfort in this mansion in the sky. Rising 82 stories over Tribeca, one of the world's most sought-after residential enclaves, Thirty Park Place combines the grandeur and old-world glamour of Art Deco architecture with the five-star luxury of Four Seasons amenities and services. Residences in the limestone tower begin on the 39th floor and are accessed by a private lobby featuring round-the-clock doorman, bellman and concierge service. On the 38th floor, residents enjoy stellar private amenities including a state-of-the-art fitness center and yoga room, Roto-designed children's playroom, screening room, and a conservatory and private dining room with outdoor loggia. Below, The Four Seasons Hotel provides direct access to even more enviable amenities, including a 75-foot pool, salon and spa, attended parking garage, ballroom and banquet facilities, CUT by Wolfgang Puck, lobby lounge and bar, and a comprehensive suite of la carte services, including in-room dining and housekeeping.